Once a scrapbooker knows her style, scrapbooking becomes easier and more focused. 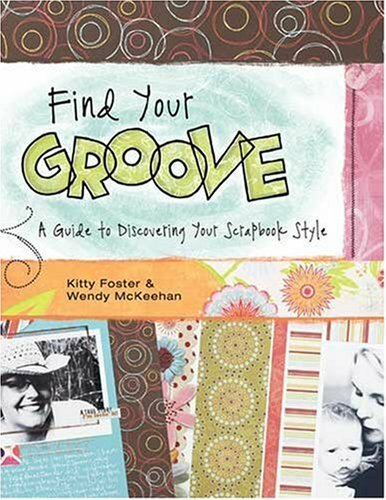 In Find Your Groove, authors Kitty Foster and Wendy McKeehan take readers on a journey of discovery with fun exercises, prompts and lots of page examples. This inspiring guide takes readers by the hand with engaging writing, insightful sidebars, and examples of art from a variety of designers to help them find their own unique and distinctive scrapbooking style. With over 120 layouts, the book is high on inspiration and if I were to classify its 'style' based on their descriptions, I would have to call it a Eclectic/Hip & Trendy combination. the book is well-organized and full of fun swirls and doodles and well as lots of many illustrations with a hand-drawn, water colored look. Honestly, I can't really think of any 'CONS' for this book. It was informative, inspirational and FUN! 5 STARS!! Worth Every Penny!